It's not yet clear how the law, passed Wednesday, will be enforced. A new law in Quebec may force Muslim women to uncover their faces if they want to receive public services. The Canadian province passed so-called "religious neutrality" legislation Wednesday. It bans people from receiving and providing public services if their faces are covered. This includes schools, public heath services and public transportation. Quebec Premier Philippe Couillard said the new law addressed communication and safety concerns, saying: "You speak to me, I should see your face, and you should see mine. It's as simple as that." The law just passed, and it's already creating a lot of confusion. Guidelines on how to enforce it may not be finalized until next summer. Bus drivers in Montreal have asked the government for clear direction in applying the new law so they don't have to make judgment calls about who can and can't board public buses. The law doesn't specifically mention veils. And while it may allow for religious exemptions, it isn't clear how those will be determined. Opponents of the bill say it flat-out discriminates against Muslim women. According to a 2016 survey, only 3 percent of Canadian Muslim women wear a niqab. Since the law affects such a small portion of the population, some argue Muslim women are being specifically targeted. A member of the National Council of Canadian Muslims called the law "a made-up solution to an invented problem." The Guardian notes this may be the first ban of its kind adopted in North America. 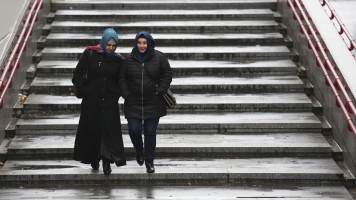 But there have been multiple bans on Muslim veils proposed in Europe: Germany, Austria, and the Netherlands all suggested or implemented at least partial bans within the last year. Quebec's decision comes amid growing anti-Muslim sentiment in Canada. Government statistics show a 61 percent increase in hate crimes against Muslims from 2014 to 2015. In that same period, violent hate crimes against Muslims increased by 141 percent.